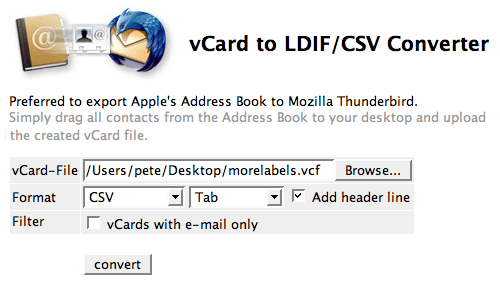 Cool app of the week: vCard to CSV Converter. The biggest problem was that I could not create multiple automatic linked text boxes in QuarkXPress 6.5. This is probably a limitation of XPress, but I worked around it by just using a single automated text box and then calculating the size of the lines in the addresses and adding blank lines accordingly. Oh, we also printed them on label sheets that were 8.75 inches by 11.5 inches, just for an added measure of fun. Posted on Friday, August 3rd, 2007 at 5:20 pm. Subscribe to the comments feed. Both comments and pings are currently closed. Post on your own blog. Another, perhaps simpler option would be to convert the vCards to hCards (several tools can do this), and then style them as you would any other web page. I don’t think the resulting HTML would have flowed into QuarkXPress very well though. I’ll definitely look at some vCard to hCard converters, as it can get a bit tedious writing hCards by hand. I was thinking of printing directly from HTML, which can certainly be difficult, but might be more familiar than Quark for some web designers. That sounds like an interesting challenge. I can see how CSS would give good control, but I don’t know how it might work across multiple pages. Worth a shot next time perhaps. I came across this tool previous week as I need to import some vCard contacts to the CMS. As naturally I prefer CSV over vCard.